In 1983 long before I got a 4wd, I walked into Davis Canyon for 7 miles to locate this image. I went looking for these paintings simply because at that time I had never seen a clear, sharply focused photograph of this riveting pictograph. 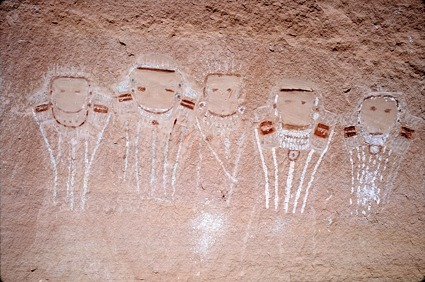 Immediately to the left of the painted faces in this photograph is another sanded area prepared for a sixth pictograph. I originally thought this meant it was unfinished due to a nearby seep line, so it is not included in the detailed color work. I now consider the spare spot to be a rough suggestion for our time.